Our goal is to make sure that everyone in the community who is in need of a cab gets one without waitting for hours no matter when or where you happen to be. We understand that nothing is more fustrating than when you have places to go such as church, work, meeting, or gathering for a special occasion and can't find reliable and affordable transportation. Newton taxi services, Inc. has changed that. We have added drivers on all shifts day & night to meet the needs of our customers. All you need to do is share the news with all your friends, family members, co-workers, and everyone else you come in contact with. 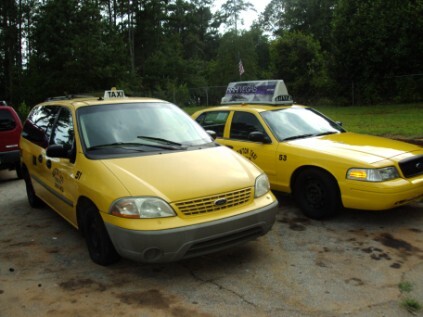 Yellow Cab- Newton Taxi Services, Inc. of Newton,Rockdale, Walton, Mcdonough, Georgia want to assure you that we are making progress everyday to make your ride less fustrating. For added conveniece and security, we have updated all our cabs with GPS devices that tell us how far the cab is before reaching your location or destination. With your help and our determination, together we can achieve great success by making Newton Taxi Services a much stonger and more dependable trasportation company in your community. We are fully committed to provide you with excellent service at a reasonable price 24hrs/day & 7 days/week. If you have not yet used our service, We invite you to try us for once next time you need a taxi. We are certain that once you give us a call you will experience a new level of confidence, friendship and sense of security first with our dispatchers, as well as our drivers 24hrs a day & 7 day a week. If you want a taxi that is reliable, safe, and reasonable in term of price, look no further. We are the company that will make you feel like a VIP once again. If you are in Walton, Newton, Henry and Rockdale Georgia we invite you to make that call and let our professional drivers take you safely to your destination. Remember, Newton Taxi Service will always pick you up in a real yellow taxi that says: Newton Taxi Services, Inc. Tel-770-787-9330. If you do not see a yellow cab with that phone number written on the cab, then it is not Newton Taxi Services, Inc. For your safety, you should never pay someone to ride you in a private vehicle. If an accident happen, you will not be covered, and you may even go to jail for encouraging illegal activities. We are located in the heart of the South East Georgia. For added assurance, always keep our phone number in your cell phone in case you need a cab right away specially during the winter season or late at night. Remember you can find us on the internet at Bing.com, google, and 800-373-3411, Yahoo, facebook, twitter, yellowbook and much more. For faster service always dial the main tel- number 770-787-9330 and one of our customer represantative will be happy to assist you. Knowing that a reliable taxi company is just minutes away to pick you up when you need a lift is priceless. Remember Newton Taxi Services, Inc. is open 24hrs & 7 days/week for local & long distance. Call us 770-787-9330.